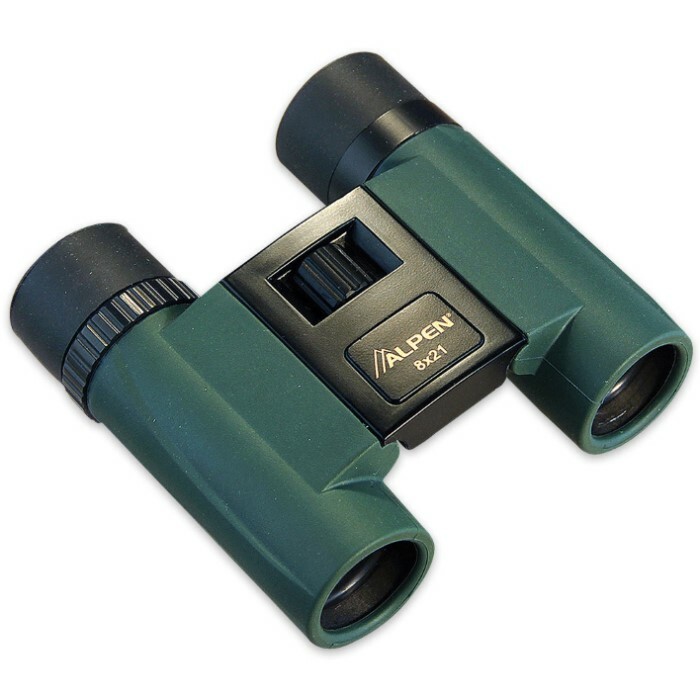 Alpen Sport 8x21 Green Rubber Armored Binocular | BUDK.com - Knives & Swords At The Lowest Prices! The 8x21 Alpen Sport Compact binoculars are made with green rubber armoring to be durable in the field. Manufactured with BK-7 glass prisms and coated optics, these binoculars have an image quality that won't disappoint anybody. The rubber fold-down eye cups make them comfortable to use and your field of view is 378 ft at 1,000 yards. They are lightweight and portable for the maximum in convenience. These 8x21 Sport Compact binoculars are backed by Alpen's lifetime warranty.